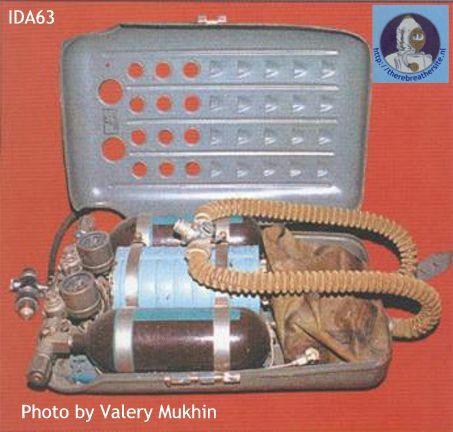 This rebreather is developed in 1966. Basically it is intended for carrying out of salvage-operations under water on depths up to 120 meters. The device is part of the complete set light diving equipments SV SPL and can work with the help of a breathing mix supplied by a hose, and also functions independent, using nitrogen-helium-oxygen a mix from a cylinder in the device. The maximal depth of immersing - 120 meters. Operational at average work - 2,5 hours. The respiratory system is filled by a gas mix through lung and the automatic device. Except for that the design stipulates periodic washing of respiratory system with the help of the time mechanism, and also a light signal (lantern FAS-1) about pressure drop in a hose.